There are a lot of big decisions you will make for your home, but few of them will be bigger than who to hire when you need roof repairs or replacement in Tyrone, GA. If you’re struggling to figure out which contractor is the right one, here are three keys that will help you sort through all the noise and find the best roofer. There are dozens of contractors in Tyrone GA who advertise services like roof repair and replacement but may not have the necessary skills and experience to provide you with the best quality roof. Instead of going for the cheapest or the first contractor you find, take time to research how long they have been doing roofing in Tyrone, and the types of roofs they specialize in (commercial, residential, industrial, etc.). It is also a good idea to check whether they have the proper business licensing and insurance to protect against damage during the roofing process. Word-of-mouth referrals are the best way to find a roofing company in Tyrone who will provide you with quality work, a fair price, and great customer service. There are a lot of ways that you can get referrals, whether from a friend, neighbor, or relative; from online reviews; or by requesting a list of references from the Tyrone roofer and calling past clients to discuss their level of satisfaction with the company. Quality roofing is about more than just the skills and experience to install a good roof—it should also include customer service that goes above and beyond your expectations. When researching roofing companies in Tyrone, GA make sure you ask a lot of questions and pay attention to things like how well the contractor can answer them using terminology that you understand, how patient they are with your questions, and how well they explain the process. If they seem agitated at your questions or always speak in jargon that you wouldn’t understand, move on to another roofer that will value you as a customer. Once you find a roofing contractor who has these three qualities, you can discuss the job you want them to do, get a quote, and get started on your roof repairs or roof replacement in Tyrone, GA knowing that you have the best contractor. Is Your Roof Helping or Hurting Your Curb Appeal? Very professional, pricing is great and the workmanship is awesome. The way the crew works is amazing. Cleaned up when they were finished and then some. 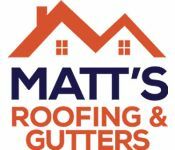 I would recommend Matt's Roofing to everyone. Thanks again Matt for a great job.